Located in a room near the second butcher. After taking care of the first butcher, go up the stairs after the area that is swamped with water. Trapped inside a barrel, Laurentius is located in a room to the left. Roll into the barrels to safely release him. 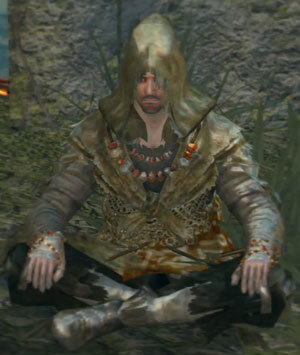 After you rescued him, he'll sit on the ground near the entrance to Frampt. If you talk to him while having a Pyromancy unique to Quelaana (e.g. Great Combustion, Fire Whip, etc.) or entered the Chaos Servant covenant (i.e. Great Chaos Fireball and Chaos Storm), he'll ask you how you got it. If you answer "Yes," he will leave Firelink Shrine and can be found hollowed in front of the lower Blighttown bonfire near the two Giant Mosquitoes. Note: Be aware of his Blighttown question. You may simply answer "No" to his last question and he will stay at Firelink Shrine and continue selling pyromancies. Answering with "Yes," will lose you the ability to purchase Iron Flesh and Flash Sweat as neither Eingyi nor Quelaana sells you these. More importantly, this will also lose you access to him upgrading your Pyromancy Flame to +10 in order for Quelaana of Izalith to spawn; you would then have to ask Eingyi to do it. In order use his services, the correct answer to his first question ("Ah, unless you find the magics unsavoury?") is "No". If you answered "Yes" instead, the answer to his second question ("Oh, and er…if by chance you've had a change of heart, …") should be "Yes". When your starting class is not a Pyromancer, he'll share his Pyromancy Flame with you. He upgrades the Pyromancy Flame up to +15. Fire Orb 8,000 6 1 Hurls flaming orbs. Combustion 500 16 1 Shoots a close range burst of fire from the hand. Iron Flesh 2,000 3 1 Greatly increases defense at the expense of mobility. Only Laurentius sells this. Flash Sweat 2,000 3 1 Covers the player in water for 1 minute. Only Laurentius sells this. Fireball 800 8 1 Throws a ball of flames that explodes on impact. 5 additional Humanities using the Dark Hand. If you accidentally make Laurentius hostile by hitting him with a weapon while trying to free him from the barrel, you can still get him to go to the Firelink Shrine as long as you do not kill him. 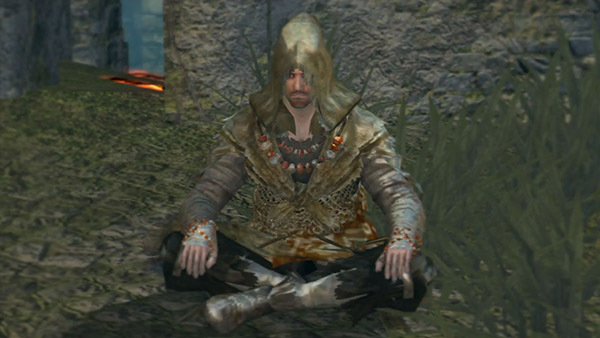 Go to Oswald of Carim and request Absolution; after paying Oswald's fee Laurentius will appear at Firelink Shrine. Equipped with a unique version of the Pyromancer Set which contains no item names or descriptions and cannot be equipped on female characters. … She'll have me for lunch! I would have been her supper without you. Thank you, thank you dearly. I am Laurentius, of the Great Swamp. I will not forget my debt to you. I'm fine, thanks to you. Well, I see you made it out! Yeah, I made it out safely, too. I have my Pyromancy of the Great Swamp, so I can usually manage, with a bit of care. Oh, yeah, by the way, er, I can share my spell with you. I think you have a knack for it. All you need are the materials. I'd be pleased to help you. … Ah, unless you find the magics unsavoury? I'm sure they'll be of some use, some assistance. Why, let's get started right now. Here, first, take this. A flame from﻿ the Great Swamp. Now you're a fully-fledged pyromancer. Oh, really… Well, that's a shame. But it is your choice. I'm on the fringe; yeah, I know. Undead or not, that's who I am. I only wish that I could have repaid you somehow. Oh, hello, there. I am pleased to see you safe. I'll be pleased to assist you by sharing my spells. and pyromancers are considered rather unsavoury. Which is fine, as I never got along with anybody anyway. So, for me, turning Undead didn't change a thing! A pyromancer's flame is a part of his own body. The flame develops right along with his skill. … Sorry. You're a pyromancer yourself. You already know this. The flame develops right along with his skill…. When I gave you that flame, I gave you a part of myself. Please take good care of it. had a funny way of putting it. is the godmother of pyromancy. So, the day I became Undead, I was ecstatic. I felt as if I'd been chosen to attune myself to the ancient arts. I am pleased to see you safe. As always, if you provide the materials, I can teach you pyromancy. Don't you dare go Hollow. You've been a stranger these days. Tell me about it. I have never seen anything like it. I'm still an able pyromancer. I shall locate her myself. I am in your debt, once again. … I see. I suppose I was mistaken. In any case, I definitely trust you. * Whoa! What's wrong with you! Stop that, please! * Whoa! What are you doing?! It is I, Laurentius! I have no bone to pick with you! Curse the heavens! Are you mad! I owe my life to you! This is wrong! You were my friend! You detest my pyromancy! That must be it! Then, I'll give you a taste of it! And it will not be pleasant, I assure you!